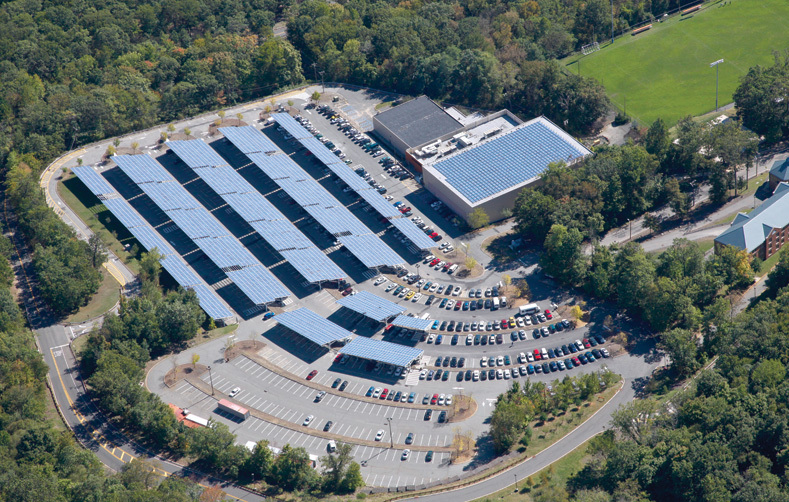 William Paterson University in New Jersey is cutting its carbonfootprint—and its energy bills—with the largest solar PV panel system installed at a U.S. university: a total of 3 MW of panels on rooftops and on top of carports. 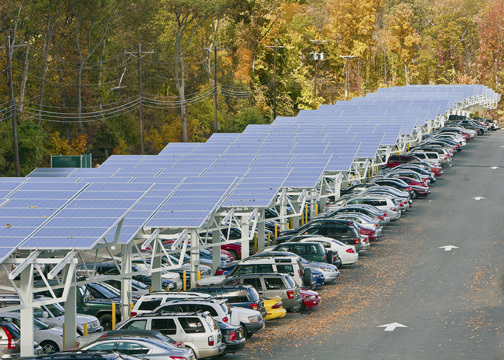 SunDurance Energy LLC recently received an education in New Jersey geology—working on a bustling university campus and designing aesthetically pleasing carports—when it built a 3-megawatt solar system for William Paterson University. The Edison, N.J.-based solar energy developer passed the test by working closely with university leaders and campus police at the 11,000-student campus in Wayne, N.J. The project, which will supply 15 to 20 percent of the campus' power needs, is also the largest PV panel system at a U.S. university to date. "It's been so well received," says Stephen Bolyai, university vice president for administration and finance. "I've never had anyone say, ‘why did you put those ugly things in our parking lots?' The campus is extremely complimentary on what we've done. These are a very visible example of saving energy and cutting our own carbon footprint." The project is also a prime example of how a public institution can successfully pair with private companies, he says. Nautilus Solar Energy LLC of Summit, N.J., financed, owns, and operates the PV system under a 15-year power-purchase agreement with William Paterson University. In return, the university will buy the solar power at a reduced rate that is expected to save it more than $4.3 million on its energy bills over the life of the contract. Energy conservation and energy efficiency have been at the forefront of the university's activities for the past 10 years, Bolyai says. In fact, the institution has cut its energy use by 30 percent even though its physical plant has increased by 25 percent. "Employees and student clubs have been very active," Bolyai says, referring to energy conservation. "Like most universities, we're trying to do more with less resources and without raising tuition. It's not just solar panels. It's lighting retrofits, HVAC controls, single-stream recycling, occupancy sensors, and any feasible energy savings idea." In 2007, the university was a charter signatory to the American College & University Presidents' Climate Commitment, a national initiative with a goal of carbon neutrality at member institutions. More recently, the university received a grant to install smart controllers to monitor systems in its buildings. It also replaced all of its boilers with more efficient gas boilers. When university leaders moved to the next step of installing solar, they not only looked at long-term cost savings but also how the project would mesh with the university's philosophy. "We recognize the university's social responsibility, and as citizens, we all have a social responsibility to reduce our carbon footprint," Bolyai says. "It's doing the right thing." The university first began considering a PV roof-mount project about four years ago. But most of the roofs were too old or had too many penetrations to make them cost-effective. "They had tried to bid the project a bunch of times, and they really wanted some innovative ideas and somebody who would get the job finalized," says Chris Krempecke, SunDurance project leader. SunDurance proposed building carports and installing the PV panels on top of them. The resulting project involved three roof-top mounts, accounting for about 30 percent of the total project. The remaining 70 percent were installed atop the carports. PV arrays were set on precast foundations 30 inches in diameter, sunk 6 to 12 feet in the ground, depending on the bedrock. The challenge was the bedrock differed under each site. As part of the winning bid, SunDurance had secured a Power Purchase Agreement (PPA) contract with Nautilus, Krempecke says. Bolyai says university leaders liked the idea of a PPA because the institution had no up-front capital costs. "Also we felt we didn't want to have to operate the facility," he says. "If we owned it, we'd have to have people on site and maintain the panels." In winning the bid, SunDurance had to meet the university's strict criteria. The project couldn't reduce the number of overall parking spaces, since the urban campus already has more parking demand than it can supply, Bolyai says. The structures had to be aesthetically pleasing, they couldn't infringe on future parking lots, and no trees could be removed during construction. 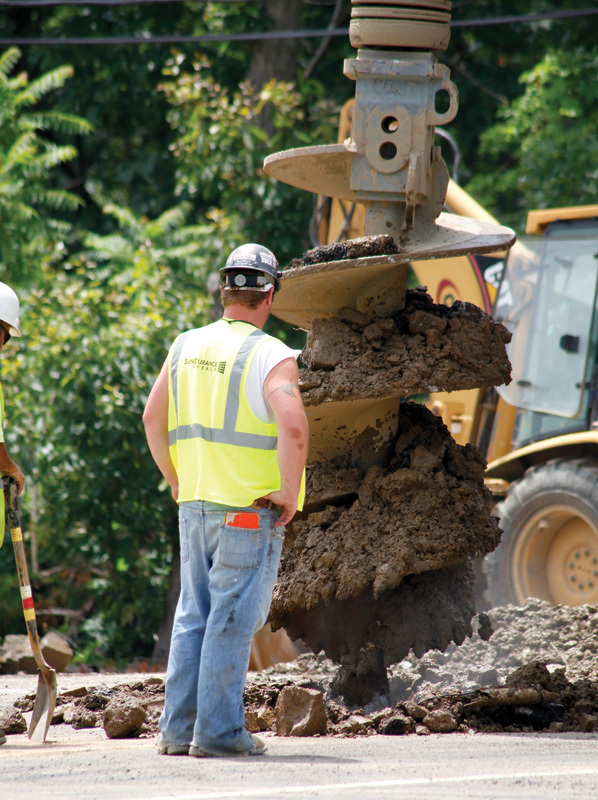 In addition, the contractor would have to work around everyday student comings and goings and cause minimal impact on campus operations. PV arrays were set on precast foundations 30 inches in diameter sunk 6 to 12 feet in the ground, depending on the bedrock. The solar PV arrays were fixed in place and tilted at a 10 degree angle toward the south. What SunDurance soon found out was the bedrock differed under each site. "When you drilled into rock, every single hole was different," Krempecke says. "You could spend hours drilling with the wrong piece, and it took getting the first hole down. Then we'd know the type of bit you had to use to fix the drill width." SunDurance turned to the expertise of its sister company, Conti Enterprises Inc. of South Plains, N.J., which specializes in engineering and construction. "A whole lot of different methods were used to find the right equipment that worked the best," he says. Because of the drilling challenges, some shifts were extended, second shifts were added, and some Saturdays were worked to recover lost time spent figuring out the bedrock. They also brought in a second drill when the project began to fall behind schedule. "We learned a lot about how to drill that part of New Jersey," Krempecke says. HBC Electric Co. Inc. of Lodi, N.J., along with members of the International Brotherhood of Electrical Workers Local 102, brought its expertise to the site as the electrical contractor. On top of the drilling challenges, the companies had to work around an overcrowded campus and could only block off a couple of lanes of traffic—one for deliveries and one for construction. So Krempecke says they had to work in stages, bringing in only as much material as they could use that day. "It was just in time," he says. "It was a little bit of a headache." They also worked closely with campus police to keep curious onlookers at a safe distance or have cars towed that were parked illegally in the construction site. "They were a big help," Krempecke says of the police. SunDurance always had a manager on site and met regularly with university leaders to keep them abreast of the project. Ground was broken in February 2010, right in the middle of the school year. The project involved six connections completed in three different phases. The first was to be finished by early June; the second, the end of July; and the third by the end of August 2010. The construction site did receive a bit of a reprieve during summer school, when fewer students attend the campus. Compared to a traditional ground-mounted system, the William Paterson carport project had to span longer spaces with fewer columns to accommodate cars and pedestrians moving beneath it. Compared to a traditional ground-mounted system, the William Paterson carport project had to span longer spaces with fewer columns to accommodate cars and pedestrians moving beneath it. Wind and snow loads also had to be figured into the project's engineering, which was all done in-house by SunDurance. Because of safety concerns, William Paterson required the lighting be the same as it was before the construction. Upon completion, the lighting actually was better because of new highly efficient structures. The carports also were designed to complement the university's 370-acre hilly campus. Lot 6, for example, is set on a hillside and comprises six tiers, each 10 to 15 feet higher than the previous one. The tiers also follow the curvature of the hillside. "It was really challenging to design these facilities," Krempecke says. ProTek Park Systems of Cincinnati, Ohio, manufactured the parking structures. On the rooftops, SunDurance used the PanelClaw installation system, a three-point non-penetrating roof-top mount by PanelFlow, of North Andover, Massachusetts. Krempecke says they chose the PanelFlow system based on their past experiences. "They came out with a relatively new product at a time when we were spending a lot of time researching it," he says. "In each of the installations, it would rank in the top tier." Altogether, the roof-mount and carport project involved 11,780 230-watt polycrystalline Yingli Solar panels from Yingli Green Energy of Baoding, China. Past experiences with the product, as well as price, reliability, and availability, played into its choice for use at William Paterson University, Krempecke says. Relationships also played into the use of PV Powered inverters from Advanced Energy of Fort Collins, Colorado. "We have preferred vendors for equipment—based on price and warranty and the strength of the company," he says. William Paterson University isn't stopping with 3 MW, Bolyai says. University leaders are looking to add another 500 KW of roof-mount PV on top of a few additional buildings as soon as rooftop improvements are completed. A new 1,000-space parking garage, which is in its infancy, will also feature rooftop PV panels. "We're just in the process of selecting an architect for the garage," Krempecke says. "We've even looked at having wind turbines on campus. We haven't gotten too far into it because of concerns about 300-foot towers. Alternatively, we're looking at smaller versions of those. "We're also investigating replacing fixtures with LED [lighting]. It's an ongoing activity. It's very embedded in what we're doing here."